The old record-a-video-when-you're-trying-to-take-a-picture trick. Gets me every time! I'm the expert auto-timer photographer of the group so I had the camera precariously set up on a bench and some plastic drawers, but I didn't even realize it had recorded a video until Luke and I were driving back down south. All in all, it was a wonderful trip and we love to go to Pennsylvania to visit any chance we have. Things are changing in my little hometown of Tunkhannock with two new hotels going up. I'm not quite sure how to feel about that yet, so I'll get back to you. Anyway, you're probably wondering what this giveaway is all about. I wanted to host a giveaway because a) I truly appreciate those who read my blog and b) I want to share some of my favorite things with you. Remember when I went to Nourish in Savannah last week? 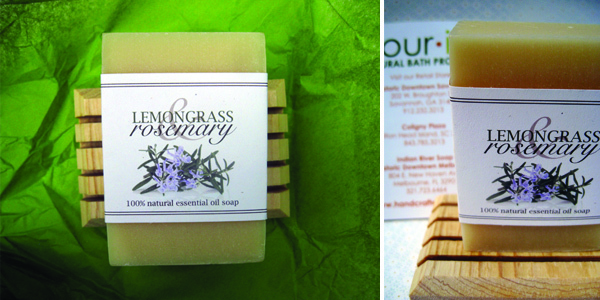 I picked up a bar of my favorite Lemongrass Rosemary soap for one of you to try. It is SO wonderful and refreshing and you're going to love it. I'm not hugely into scented things, but when it comes to anything lemon, I'm all for it--especially paired with something so wonderfully fragrant as rosemary. Mint, almond, vanilla and tea tree are among some of my other favorite natural scents. These natural scents trump fake chemical ones any day of the week. What about you? Do you gravitate towards certain fragrances for candles, essential oils and body products? To enter the giveaway, leave a comment with your name and your favorite scent. 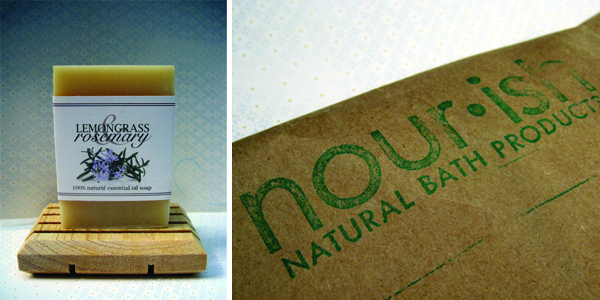 If you need some ideas, check out the soap selection at Nourish. They have some wonderful combinations too. One winner will be selected at random on Friday, April 29th (ending at midnight EST) and notified via e-mail, so be sure to leave me a way to get in contact with you! The winner will receive one bar of soap and the handmade wooden soap dish pictured (perfect for helping your handmade soap last longer). Thanks and good luck to everyone.